Welcome back to Boards & Barley! It’s been a while since I posted and I blame it all on my kids. I’ve got three little rugrats and they often find ways to fill all of my “free” time. But I’m back today with a recap of the Boards & Barley that I’ve enjoyed over the past couple weeks. Before that, however, I’d like to mention how awesome it’s been with having kegged beer. I put the kegs into my basement refrigerator and I now have cold beer on tap. I need to thank my neighbor once again for loaning me the equipment. I wouldn’t have been able to afford two kegs, regulator, gas lines, taps, and CO2 tank otherwise. If you want a beer on tap without having to pay $5 for it, head on over and I’ll pour you a cold one! Don’t be sad, little guy. You tasted pretty good! I brewed this “Northern Brewer Caribou Slobber” kit back in May and let it age (unintentionally) in my basement for four months. This was a kit that my older brother gave me as a Christmas present last year. It’s fun to get a beer kit as a Christmas present. So the other night with some friends over I took some glasses down to the basement fridge and filled them up from the tap. It wasn’t the best brown ale I’ve ever had, but I’m not disappointed to have 4 more gallons of it either. The Wealthy Lazeabouts by Jeremy Van Maanen can best be described as an auction game about bidding on who will win the auction. When I originally heard about that theme I cringed a little. It seemed boring. But we played the prototype the other night and other than a balance tweak and art upgrade I’d buy this game! It was highly enjoyable, provided for interesting choices, included a LARGE amount of player interaction, and was plain fun to play! Super Ego by Adam Buckingham is all about Super Heroes who are more interested in glory and honor than in actually rescuing innocent victims. In the game you are one of those super heroes. During the game you’ll collect skill cards and use those skills to perform rescues and earn honor. Sometimes you may be able to earn honor that you can post on your timeline on your HeroBookFace account for all the other super heroes to see and envy. This game was full of intriguing choices, options to hose the other super heroes, options for revenge, and fun gameplay. Both of these games were amazingly successful for their first playtests. If you are interested in playing either of them they’ll both be available to play at Protospiel-Madison in a few weeks. After playing The Grand Illusion 4 times in the past two weeks I’ve decided that the game needs to be redesigned. With a theme of magic and illusion it really needs to have awesome magical elements in the game. With the players representing illusionists I want the gameplay to feel like you are being sneaky and pulling things over our heads. I want there to be magical elements, common tricks, and other things that are generally associated with magic and illusions. So I’m turning it into less of a card based game and more of a classic Euro game. Imagine being the magician and having a few assistants to help you gather the equipment you need, market the show you’ll put on, and help you practice. Also imagine the assistants utilizing magic to help you out. Your objective is to begin as a street performer and work your way up to performing a Grand Illusion in a theater. I’m excited about upgrading this design significantly. Since the mechanics of the old design worked I think I may utilize them with a different theme. Also on the design front I designed an expansion for Scoville. It took about three hours to scheme up the design, create the art, and make 36 new cards. I’m super excited to try it out. Also, I have three other expansion ideas for the game that I’ll try to mock up before Protospiel-Madison. It was fun to work on Scoville again, but now I’m desperately wishing the real copies would arrive! 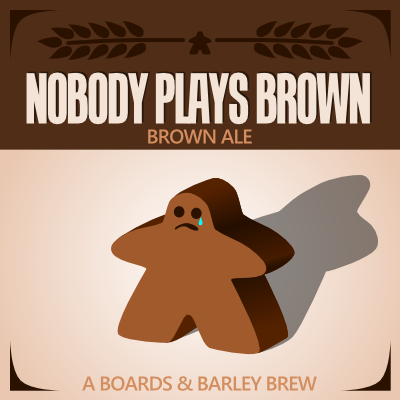 Posted on October 13, 2014, in Monday Brews and tagged beer, board games, game design, homebrew, Monday Brews, unpublished prototype. Bookmark the permalink. 1 Comment. NB Caribou Slobber was the first batch I brewed. I found a forgotten bottle after a year and it was absolutely amazing, like alcoholic cola. Of course, that was bottle-conditioned, and you probably don’t want it to sit in the keg for a year, anyway. I’m excited to hear about the Scoville expansion, and I’m looking forward to getting my copy.